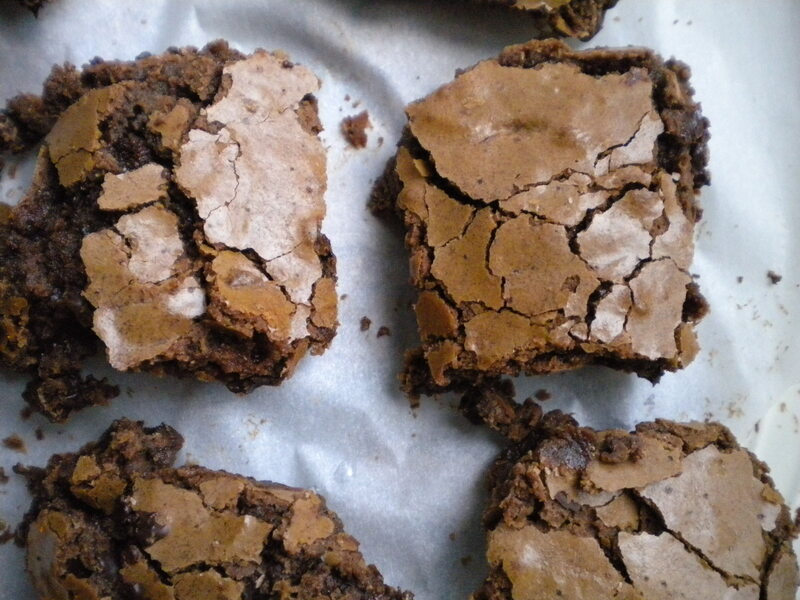 Not Box Brownies – Voila! In the ongoing search that we all have to find the best brownie recipe, I add this one to your “must try” list. These brownies are immensely rich, chocolatey and fudgy. They have the signature crackled, crunch topping with the rich goodness on the inside. I call them ‘not box brownies’ because I got the recipe from Cook’s Illustrated, who attempted to create a homemade version of the boxed brownies we all grew up on and loved. I remember many fond memories of making brownies my family and with boyfriends. Cooking always made great dates. So these brownies bring back all the great memories but they taste much, much better. Preheat oven to 350. Line 9×13 baking dish with parchment paper, leave an inch or two overhang. Butter parchment paper. 1. Whisk cocoa , coffee and boiling water together in large bowl until smooth. Finely chop 2 oz. of bittersweet chocolate and whisk into the cocoa mixture until smooth. 2. Whisk in melted butter and oil. Add eggs, yolks and vanilla and continue to whisk until smooth. 3. Whisk in sugar. Add flour and salt and now mix with a rubber spatula. Chop remaining chocolate and fold into mix. 4. Pour batter into prepared pan and bake 30-35 minutes, or until when a toothpick is inserted, it comes out slightly moist. Allow to cool completely before removing from pan (Cook’s Illustrated suggests one hour). Then let cool a bit more before cutting (Cook’s Illustrated suggests another hour or so.). Cut into squares and serve with a nice, cold glass of milk. Pingback: Pillow Cookies « Voila! Jenn and I are going to make these this weekend!